Here's a brand new look at the infamous space cop and crafty Green Lantern trainer Tomar-Re. Looks good, real good. 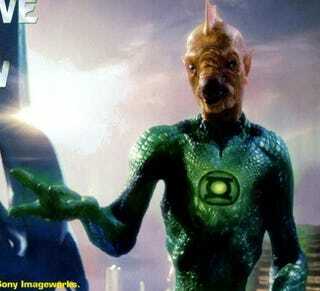 So how is it that a half-fish alien can look infinitely better than Ryan Reynold's super suit? Tomar-Re trains new Green Lantern Corps members, and fights injustice across his sector. He's a beloved member of the Green Lanterns. He's a scientist, a dear friend of Abin Sur's and the first Green Lantern Hal meets on Oa at Corps headquarters‎ (which you can see additional images of here). For a better look at Tomar-Re, head over to CBM.